USANA, word! : Metabolic Syndrome explained. Do you have it? Metabolic Syndrome explained. Do you have it? Metabolic Syndrome is the name given to a cluster of symptoms including belly fat, high blood cholesterol and high blood glucose. It affects more than one in four Australian adults – the incidence is higher in people with diabetes. Yet the condition often goes undiagnosed for many. Do you have Metabolic Syndrome? Metabolic Syndrome explainedAlso called Syndrome X, Metabolic Syndrome is a condition that’s characterised by the production of large amounts of insulin which the body can’t use properly. Insulin can’t do its job of taking glucose in from the blood into body cells, so a rise in blood glucose levels can only be detected with a medical test, although you may not have any symptoms. The resulting high concentrations of blood glucose can damage tiny blood vessels and delicate nerves. Metabolic Syndrome is very common and becoming even more so. People from certain ethnic groups (such as indigenous Australians and people of Pacific Island heritage and Asian descent) are affected most and it is often seen in women with polycystic ovary syndrome (PCOS). Symptoms of Metabolic Syndrome include:Central obesity, abnormal blood fat levels, high blood pressure (hypertension) and high blood glucose levels. So if you have these symptoms, you have Metabolic Syndrome and are at an increased risk of chronic conditions such as heart disease, stroke and other problems relating to blood vessels. Signs of Metabolic Syndrome include:Insulin resistance or glucose intolerance and impaired fasting glucose (IFG) or diabetes. What causes Metabolic Syndrome?Metabolic Syndrome is a very complex condition but three factors seem to contribute: Genetic tendency, being overweight and lack of physical inactivity. According to the Diabetes Council of Australia, ‘It’s estimated that more than 16 per cent or about two million Australians have pre-diabetes’ also known as Metabolic Syndrome. - What is insulin resistance? - Did you know that Insulin resistance raises the risk of diabetes? - What is central obesity? Hypertension? Cholesterol and triglycerides? Impaired glucose tolerance? - And what can you do? 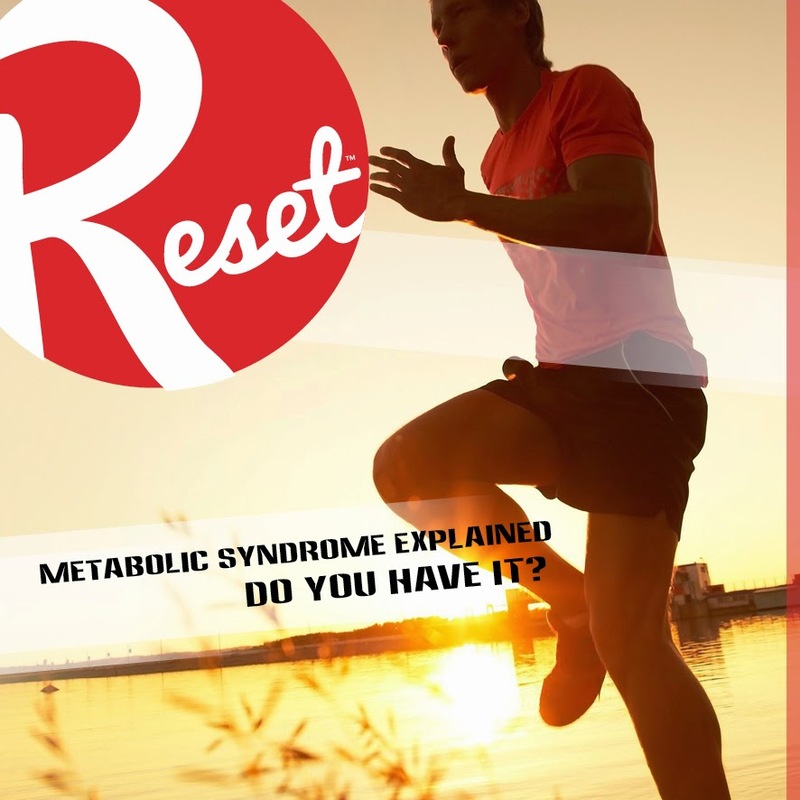 Read this week's RESETNATION Challenge kick off Information Campaign on Metabolic Syndrome to know more about the questions above and to learn what you can do about it. Click here to read it. If in doubt, it is always good to speak to your doctor.